SAMARA Gallery will present Geometric Love, a solo exhibition of museum-bound paintings and an installation by Fariba Abedin. This new body of work brings in the signature geometric style of Abedin, but introduces a new angle through exploring concepts of love. The soft curvature of calligraphy juxtaposes and blends with Abedin’s angular precision, creating a dance of the eyes for viewers. A work explores geometric abstraction with an emphasis on color study, where color and form become the subjects. 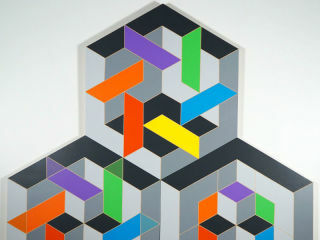 In some of her paintings, a simple concept such as the color wheel is transformed into an intriguing and complex design. She incorporates a variety of color combinations and their tints, shades, and tones to create the illusion of volume, space, vibration, and transparency. She works on canvas, wood panel and makes installations of multiple pieces creating unique displays. In the installation, Rumi’s poems are accompanied by projections of Abedin’s geometric and calligraphic paintings. Suspended elements begin to bring the walls and poetry to life. Two of the words most repeated throughout the installation are love and mercy (aeshq and rahmah). These two words not only have graceful calligraphic qualities but also are the foundation of successful personal and societal relationships. Following the opening reception, the exhibit will be on display through October 7.